• Diet affects performance. The food that we choose in training and competition will affect how well we train and play. • Every athlete is different. No single diet will meet the needs of all athletes. • An athlete’s diet may have its biggest impact during training. A good diet will help support consistent, intensive training, promote optimal adaptation to training and limit the risks of illness or injury. • Getting the right amount of energy is key to staying healthy and performing well. Excessive energy intake will increase body fat; insufficient energy intake will hinder performance and the ability to ward off illness and injuries. • Carbohydrates supply the muscles and the brain with the fuels needed to meet the stress of training and competition. Athletes should know when to eat which foods to meet their carbohydrate needs. • A balanced, varied diet will generally supply enough protein for building and repairing muscle. Additional protein intake from protein supplements is seldom necessary. • A varied diet that meets energy needs and is based largely on nutrient-rich choices should provide an adequate supply of vitamins and minerals. Young athletes should be sure to include vegetables, fruits, beans, legumes, cereals, lean meats, fish and dairy products in their diets. • Maintaining hydration is important for performance. Appropriate fluid intake before, during and after exercise can help improve performance. • Athletes should refrain from indiscriminate use of dietary supplements. • Eat something within an hour after waking up. Children who eat breakfast on a consistent basis tend to have better nutritional profiles and a decreased risk of being overweight. Breakfast consumption may also improve cognitive function related to memory, test grades and school attendance. • Keep breakfast balanced: combine a carbohydrate (starch) source with some protein and add a fruit. Remember the intake of fluid with this meal. • Eat a snack or a meal every two to three hours for better blood glucose control. • Keep snacks small and nutrient rich. 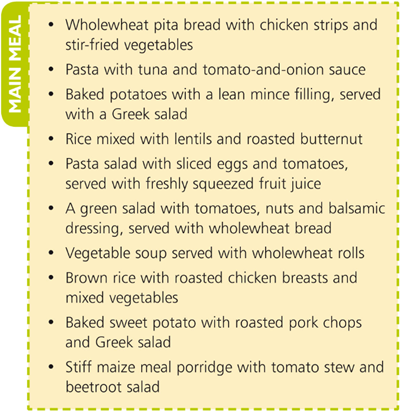 • For main meals, include a carbohydrate source, a low- fat protein choice and a generous helping of vegetables or salad. • Drink fluids like water, milk, fruit juice or iced tea throughout the day. 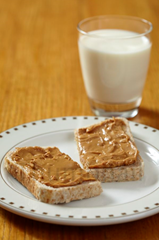 • Be sure to eat a carbohydrate-rich snack before training. • For training sessions that last longer than 60–90 minutes, drink a carbohydrate-based drink during the session. • Eat a recovery snack as soon as possible after the training session. Include a carbohydrate and a protein source.